Melinda de los Santos	Announcements, CATS, DOGS, Pet Furnituredog crates, Easy-Clean Pet Crate, pet accessories, pet crates, pet products, Richelle Corp.
As you may already know (or not), Fido ’n Fluffy’s niche is pet sports gear, glamor & fashion. But we can’t resist offering products from manufacturers and companies that are up and rising in the pet industry. They get all kinds of awards ’n stuff. 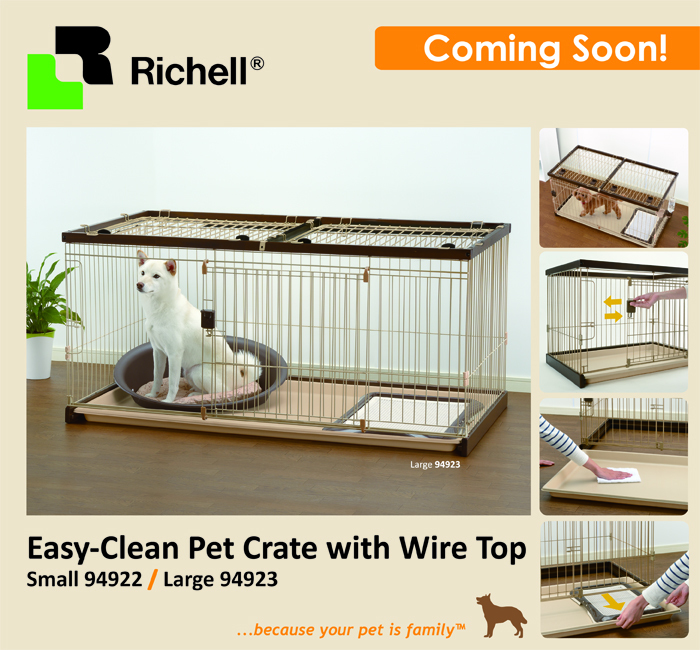 That’s why we’re announcing this upcoming product from Richelle, and they say that with Richelle’s Easy-Clean Pet Crate makes cleaning your pet’s crate easier than ever! Richell’s Easy-Clean Pet Crate comes with a sliding tray that can be removed for an easy wipe down. The specially designed sliding door opens smoothly for easy pet access. The tension locking system keeps pets secure in their crate. The wire top is included to keep pets safe. This crate has enough space for a pet bed, training tray, or toys. UPS will stop delivering to homes, and FedEx will most likely follow suit. Hehe, Fido ’n Fluffy will not be changing prices because of that. cute items you can get from Cats In The Bar and Katzenworld, the profits go to charities that help our fellow cats and dogs.